Greetings! I am glad that you have decided to visit our website. Hopefully, the information you find here will be of some help to you. 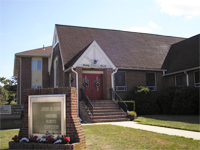 Trinity Evangelical Lutheran Church is a traditional Lutheran church encouraging and supporting family values and core Christian beliefs. We are a Word and sacrament church. That is the Word of God incarnate in Jesus Christ as revealed through the reading of scripture and through biblical preaching, and the sacraments of Holy Baptism, which is the initiation rite into the family of God, emphasizing the promise of salvation through faith alone and Holy Communion where we receive the body and blood of Jesus through the bread and wine of His Supper which strengthens and sustains our faith through the mystery of uniting us to the Holy Trinity. While visiting us on-line you will find information about our faith, and our mission. I hope that you may visit us in person so that your faith may be encouraged and your voice can be lifted up in praise of God along with ours. Should you have any questions, please contact me through our church office 856-939-4411 or via email. If you decide to worship with us be sure to fill out a visitor’s card and introduce yourself to me after the service.